LAWRENCE — The University of Kansas School of Engineering Formula car team is putting the pedal to the metal to complete the two racecars they’ll use in international competitions this spring. This marks the fourth year Jayhawk Motorsports has built two cars, a standard combustion-engine vehicle and an electric vehicle. 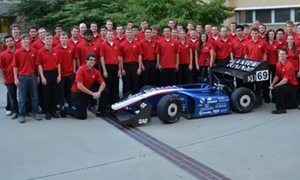 The team is set to compete in Formula SAE Michigan, May 14-17, with its combustion-engine vehicle, and Formula SAE Lincoln, June 18-21, which will be the site of both combustion engine and electric vehicle competitions. “We have a great team and a solid design, so we’re confident that we’ll have a strong showing in both competitions,” said Jill Langlas, a senior in mechanical engineering and leader of this year’s Jayhawk Motorsports Formula car team. The annual student competitions require university teams to design, build and then compete with their vehicles in a variety of tests and contests, including speed trials and presentations. With more than two decades of experience in the combustion-engine competition and less than five years of working with an electric vehicle, Langlas said the team is placing a lot of focus on ways to improve the electric vehicle – from upgrades to the drive train, to learning more about the high- and low-voltage power system. One important modification to this year’s vehicles is a change in materials with the goal of improving handling. “We switched some parts from aluminum to steel. It should make the vehicle more predictable on corners and give us better stability and better traction. Adding more steel increases the weight, which poses additional challenges, so it’s a give-and-take, but we think overall this switch will be a benefit,” Langlas said. This year’s team is composed of 28 seniors, primarily in mechanical and electrical engineering students enrolled in a capstone design course, and another 35 volunteers from a variety of engineering disciplines and other majors, including business and journalism. That legacy includes numerous top 10 finishes in a variety of competitions over the years. Jayhawk Motorsports has also finished in the top five in SAE Lincoln the last two years, including the overall championship in 2012. The team will unveil both vehicles at a reception set for 6:30 p.m. Friday, April 4, at Liberty Hall in downtown Lawrence. Tickets are $8 and can be purchased at the door.